May 27, 2010 (This is an email between myself and Cherri. My words are in blue, and Cherri's are red). While cleaning my very messy studio, I found my copy of Dear Jane and an accompanying CD. You wanna borrow them for the summer? I was so surprised to uncover them in this mess...you probably don't need them, but I thought I would ask. Now back to cleaning. Gimmie, gimmie, gimmie! I would LOVE to have this for the summer. I'm beyond interested in Dear Jane. Yay! Jill tells me that you are going to the Friday night sewcial at MD, so maybe a hand off there? I'm going too. Guess what? I'm up to 100 blocks! It's getting a bit impossible to lay them all out in my place. Maybe I'll sneak down to the meeting room of my building once I hit 104 for a photo. 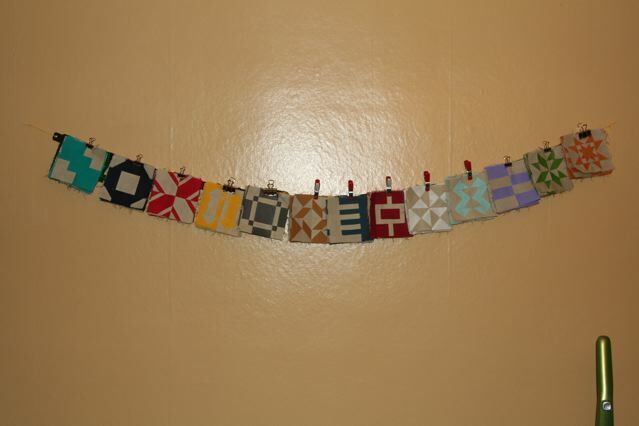 I did take a photo of the blocks on my "design wall", which is really just a leftover Happy Birthday banner I never took down. You've seen the three on the right, but the rest are new. (Also new are the 7 behind the green block on the far left). I've also been working to create digital versions of all of them so I can easily look at layouts. I was bummed to realize that sashing in the same neutral as the blocks really won't work. So many of these blocks are asymmetrical, and the detail would be lost. I think maybe a light gray with the neutral setting blocks might be the way to go. I'm also playing around with a boarder of flying geese, as I think it is a nod to the original triangles. Nothing has come to mind for the triangles, so I think that means something, at least in terms of my creative process. I have a bad habit of thinking of a block right before drifting off, so I have to wake up and write it down, but nothing has come in regards to the border. Anyway, here is a potential layout. The black blocks are all blocks in waiting, so to speak. On the day of this email, I had less than a month to finish this quilt top. Cherri had even less time before she left for Alaska for the summer. When we met up later at Modern Domestic for the Friday night social, she was bravely starting a new project, which she said she would complete when she came back in the fall. One thing about making this quilt is that I'm discovering what kind of crazy I am. I mean, I'm some sort of crazy for even doing it, but I seem to have developed little rituals associated with the quilt. 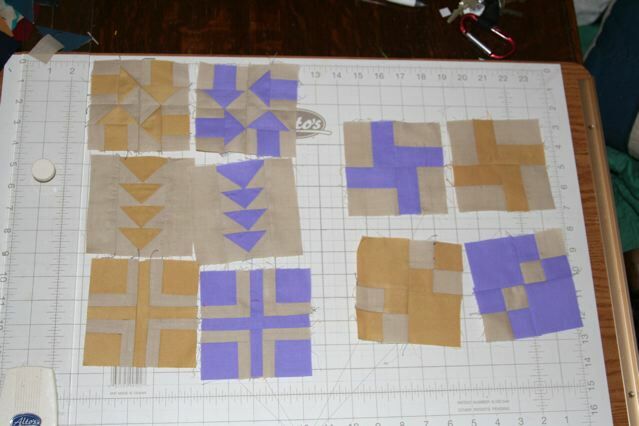 I have to make the blocks in order, one color at a time. I also have to keep them in order. They seem to have orientations too, and when one gets put back the "wrong way" I have to fix it. All these orders are made up, but they need to be just so. Last nite, my sister and I made little cross body bags. She saw a lady on Sewing with Nancy just whip one out in 10 minutes needless to say her 10 minutes took us 2 hours! The pattern which my sister figured out, takes 4 different fabrics, something strong for the strap ( I thought a measuring tape would be a perfect strap substitution, but as she only had one, i used some kind of twisted cording). It was a magic show as the little bag gets sewn up and then turned inside out and sewn some more and then turned inside out again and it is done....which left me feeling like wow, this little sucker is 100% done.....how did that happen? I will bring it to show you as it is an engineering marvel! This sounds very cool! I'm so impressed by people who do bags. I can't wait to see it at the meeting. 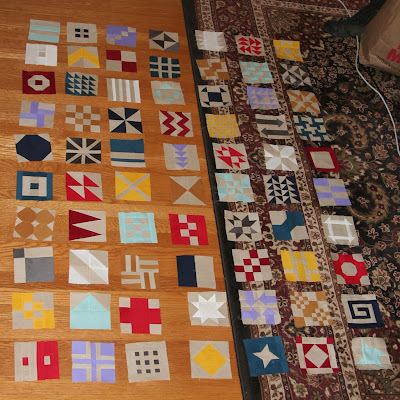 I've been plugging away at my blocks, and I'm up to 70 now. How did that happen?!! I have 150 or so blocks sketched out, but I don't know if they are all usable. I'm fairly certain I'll make it to 169, but my sketching progress has slowed down quite a bit as I work my way through the obvious blocks. At this point, I'm up for almost any kind of block. A lot of them are very traditional, but I think that there are only so many ways to divide up a square you know? I do like them all together though. It may not be "modern" in the sense of so-called modern quilting (which tends to be less complex than more traditional quilts, according to what I see on flickr) but I do think it fits in with today's quilter, if there is such a thing. I added two new colors, aqua and light purple, and replaced the third yellow (which was sort of buttery, and didn't have great contrast). I'm on a time limit though, I've got to finish this before the summer as I have a summer job at Camp Silver Creek at Silver Falls State Park, and I'll be living there for the summer. Last summer I was able to get one Thursday night a month off (out of camp anyway), so I'm hoping I'll be able to do the same this summer to make it to guild meetings. Speaking of meetings, I'll see you on Thursday! Themes of modern quilting vs. traditional quilting must have been on my mind at this stage, because I said a lot of things in this email that were echoed in my last blog post. The aqua color I added is a sheet from Target. Some of the other colors (the navy and the bright red) are sheets from Ikea. On the whole, the sheets from Target are much more durable, but a little further away in appearance from quilting fabrics. I'll bring some pieces of solids to the meeting on the 20th. I have many leftover bits that I am so glad to give to you. Any certain colors you are hoping for? Any certain colors you are NOT hoping for? Lets see, I've got two blues, two reds, and three yellows, so those are out. I don't have any orange, purple or green...I guess I'm not that fond of the secondary colors! :) I think altogether though it would look good. 36 blocks. WOW! It is amazing to see how many ways there are to divide up a square! And sew it back together. Do,do,do send a pic when you get the next set done. I am really into following your progress. What are your thoughts on the triangle block border? I have been pondering this challenge. That's a lot of triangles! I haven't approached the triangles yet, but I do want them. I just have to figure something out that doesn't involve a specialty ruler. I've sketched out about 100 or so blocks, so I'm beginning to feel like I'll make it to at least 169 squares. I'm hoping some triangle ideas will come along. If you think of something, let me know! I am on my way to visit my sister in Pasco, WA and then fly from there for a 4 day visit with my Dad in Boulder, CO. I'll take my 'puter with me so I can check my mail find the quilt shops along the way! At this point in the process, I realize a few things. The first is that if I'm going to reach 169 blocks, I have to be open to any type of block. 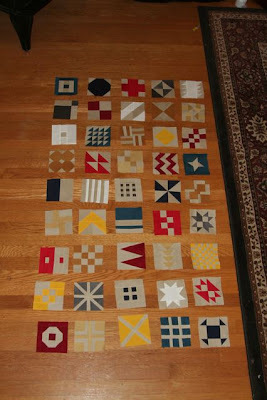 I opened up my visual research by paging through google images for the phrase "quilt blocks" and did the same on flickr. I jotted down everything that I thought I could make in a 4 x 4 grid. I totally get why people use 12 inch blocks so much, as they can fit a 3 x 3, 4 x 4 or 6 x 6 grid block without any issues. The world is very open to a 12 inch finished block. The second is that I had too much yellow going on. I used all the colors in the photo because they are what I had on hand, but when looking at the picture above, I could see that it was leaning to0 heavily in the yellow direction. I replaced the dullest yellow with a light purple. It's not to say that I didn't like that color, because I liked the tone on tone quality quite a bit. I just didn't think it matched the impact of the other colors, and didn't photograph as well. In particular, I wanted people to notice this block. I'm not going to say that I'm the first person to ever make a block that looked like arrows, because I highly doubt there are many original block designs after all this time (with the exception of applique), but arrow type blocks are something that is not common in quilting right now, according to my highly scientific research methods of browsing flickr and google. This post wouldn't be complete without a look in my sketchbook. I wish I could find my black pen.